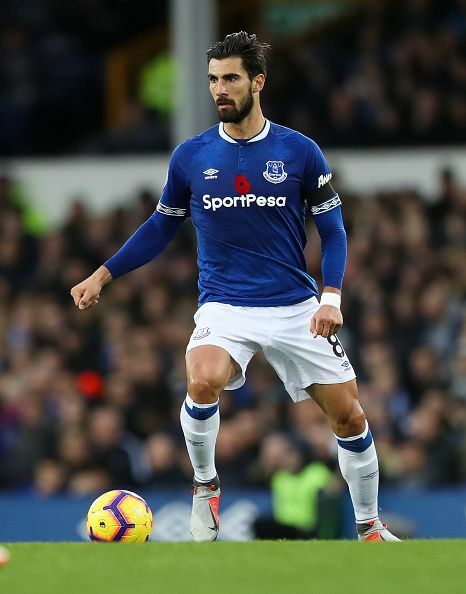 Andre Gomes is a Portuguese professional football player who plays for Everton, on loan from FC Barcelona and the Portugal national football team. He was born on 30th July 1993 and hails from Grijo in the Porto district in Portugal. He plays as a central midfielder, but has also shown the capability to play on the either flanks of midfield. He is a right-footed player with a very decent left foot as well. His playing style would be best described as that of a deep lying playmaker with great technique on the ball. A versatile and gifted player, his exceptional field of vision and the prowess to initiate an attack from midfield, are the most notable of his abilities. Not the fastest on the pitch, he is instead blessed with a great reading of the game, and physical strength. Standing at 6 ft 2 in, he is calm and assured presence on the ball is able to hold on to the ball stubbornly while in attack. A great player in defense as well, he specialises in making interceptions and cutting out through balls. He was part of the Portugal squad that won the European Championship in 2016 at France. He also played in the 2017 Confederations Cup at Russia, where Portugal came third. Hailing from the Porto district, he joined hometown club of FC Porto as a 12 year old, playing for their youth setup for three years. He played a year for Pasteleira before moving to Boavista, and playing for their youth team. He moved to Porto’s rivals Benfica in 2011 and played with the S.L. Benfica Juniors. Impressive performances saw him promoted to both B squad and the senior team, the following year. An integral part of Portugal’s junior team at every age group, he was selected to play for the senior team as early as 6th February 2013, as he was on the bench for Portugal’s 2-3 defeat against Ecuador in an international friendly. However, he made his debut a year later on 7th September 2014, in a UEFA Euro 2016 Qualifier match against Albania. It was a disappointing debut for him as Portugal lost 0:1 to a team they were expected to defeat easily. He first attained success while playing for Benfica as he helped them win the domestic treble before earning a loan move to Valencia CF which was subsequently made permanent after he established himself as a starter for the club. But his actual rise to glory came after the success of the UEFA EURO 2016 in France, with the national squad. His talent attracted the interest of Barcelona who signed him on 21st July 2016, for a reported 35 million euros, plus 20 million in add-ons. Since his move to Barcelona, Gomes has failed to adapt to their unique style of play rendering him mostly to the bench which has affected his morale and saw a dip in his international form as well. He has made senior appearance for Valencia, SL Benfica and Barcelona, while also appearing in the youth teams of FC Porto, Pasteleira, Boavista and Benfica. He has won the domestic treble with SL Benfica in the 2013-14 season. He was also part of the Portugal squad that won the 2016 UEFA EURO in France.